Tagged action, Adventure, alpine, Austria, contest, winner. Really honored to be declared Grand Prize Winner of the 28th edition of the Memorial Maria Luise Mountain and Adventure Photo Contest. 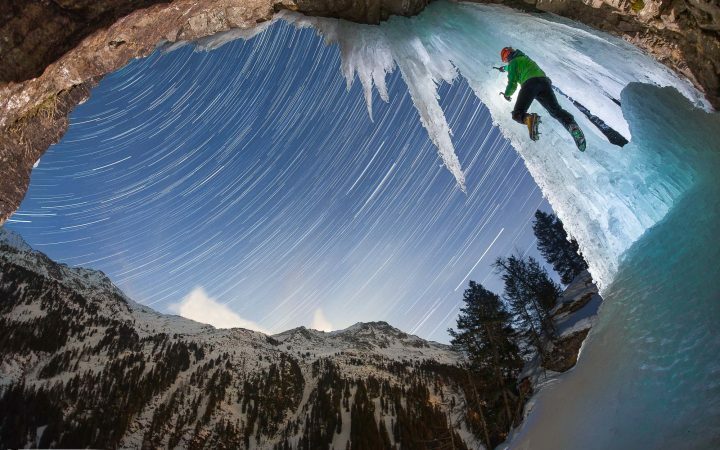 15,000 photographs were submitted by 1,586 photographers from 89 countries and the image from our ice climbing project @Felbertauern came out on Top. In addition to winning the mountaineering category, the image has been awarded the absolute prize of the mountain and adventure section. Being recognized at a major competition is always an honor, winning a Grand Prize even more so. As always there are many incredible images of reputable names in the field of finalists that would from my perspective at least equally deserve to be here. I am really honored to see my name amongst so many people who’s work I admire and who also inspire me in my projects. 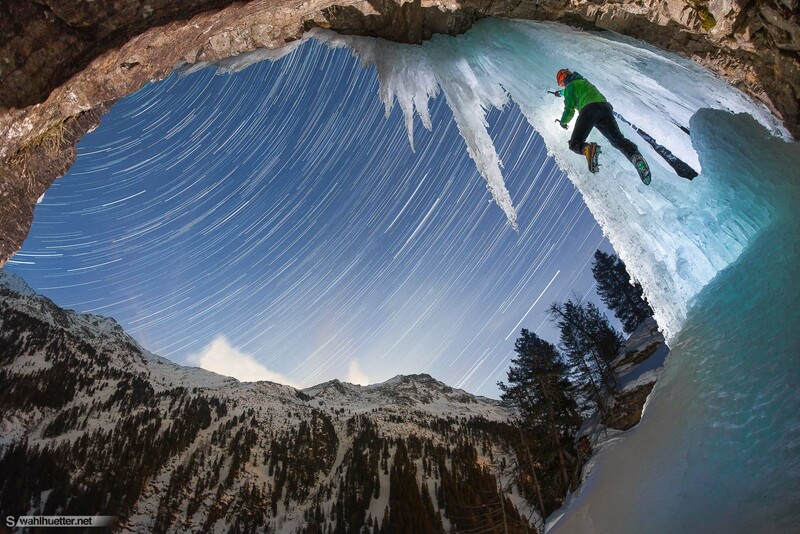 The image was created at the „Nordportalfall“ (Northern Portal Ice Fall, Felbertauern) in Austria and shows alpinist and ice climbing athlete Philipp Pichlbauer soloing an ice fall at night. This photo is a combination of long time exposures and external flash photography. Despite this award we have two other images highlighted as Honorable Mentions in the contest. You can take a look at the highly particular collection of Honorabel mentions and winning photographs through at the contests website: http://www.memorialmarialuisa.com or in this presentation video. Anyway probably the best time to enjoy the images will be during the outdoor exhibition and audiovisual organized within the events that will take place to commemorate this edition as well as the ceremony of presenting awards to the winners. These will take place, in Infiesto and Oviedo, on the 4th and 5th of May, at 7:00 p.m.
Special thanks to Philip Pichlbauer and Jef Verstraeten for helping me realize this project and putting in the time and effort. Honorabel Mention in the category „Alpinism“ in the 28th edition of the MML Mountain and Adventure Photo Contest. This image was also taken at the Felbertauern in Austria during the same project one day before the winning image shot. It shows a combination of long time exposure, external flash photography and light painting. The image is a single image long time exposure. The project was realized with the athletes Phillip Pichlbauer (picture) and Jef Verstraeten. It took us quite some time of preparations and patient waiting in the cold for the right vehicle to pass through the tunnel in order to get the desired effect we wanted. Finally we got rewarded with this shot when a big truck passed through. 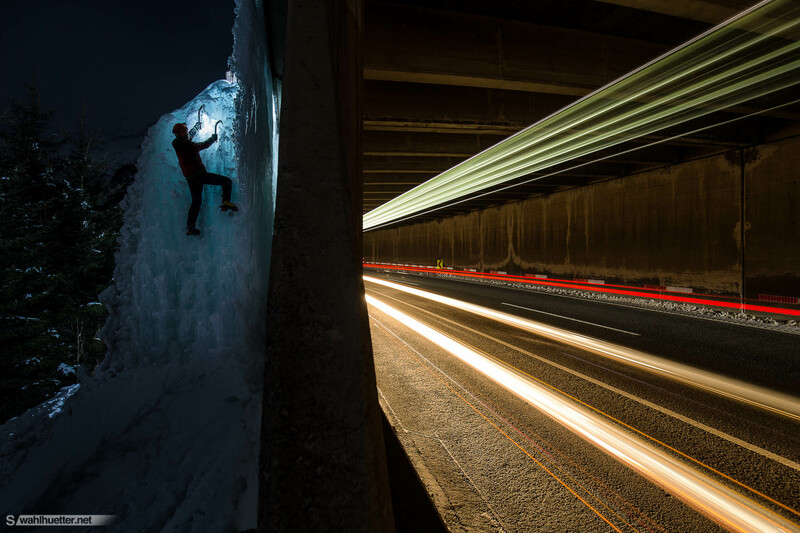 This photo is a creative approach to combine mountain sports, adventure and creative storytelling in a single image. 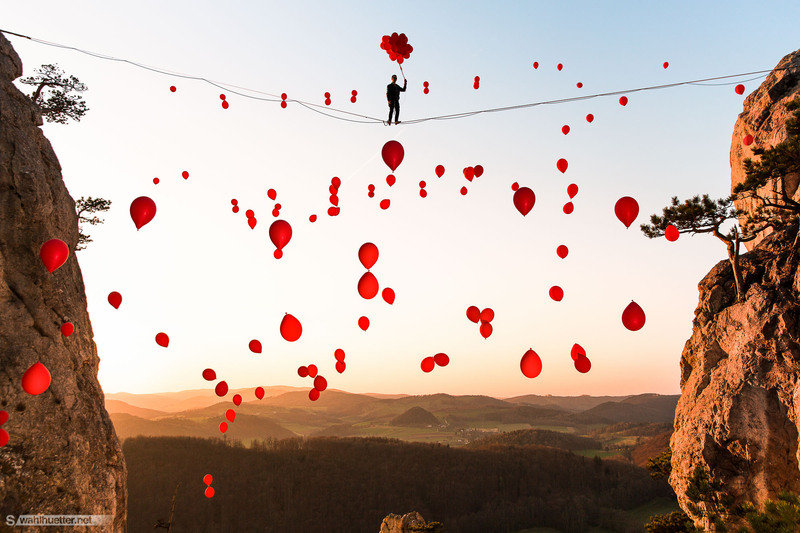 The story of 99 red balloons floating towards the horizon performed by the band ‚Nena‘ was originally inspired by balloons raising over the Berlin Wall during the era of Cold War in the 1980s. In the song the balloons were mistaken for U.F.O.s what led to a quick escalation and eventually the end of the world. Given the present situation on our shrinking planet this topic is unfortunately very up to date. So I created a quick reminder with the help of the Vienna Slackliners. This is a single image (no photoshop) and we used the most ecological natural latex balloons we could get, removed all of them afterwards and left no traces behind. More infos in a separate blog post.